Need a deep nourishing therapy for your irritated skin? 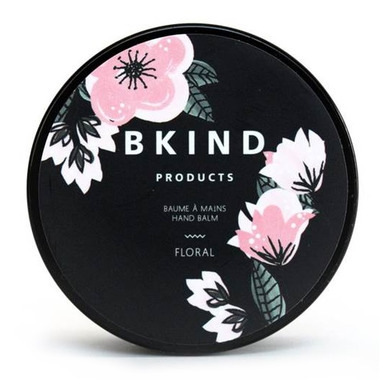 The BKIND hand balm, made with the finest moisturizing ingredients, will come to the rescue of your dry skin areas, just like your hands, constantly exposed to external damage. Made with shea butter, a natural source of vitamin A, our hand balm moisturizes, soothes and promotes tissue healing. It also contains coconut oil, well known for its nourishing, emollient and repairing properties, that will add a smooth texture and delays skin ageing. Apricot oil will penetrates into your skin quickly, leaving your hands feeling soft and non-greasy, while the added vitamin E naturally helps boosting your collagen production and maintains skin elasticity. Finally, all those powerful natural ingredients comes together as a winning formula to keep your hands soft, young and protected. To Use: Massage a small amount of our balm on your dry skin areas and on your hands, when needed. (Our products do not contain water; a very small amount is enough!) Then, let yourself be charmed by the pleasant scent of rose*! Ingredients: shea butter, coconut oil, apricot oil, rose extract, geranium essential oil and bergamot essential oil. Smaller then expected. Don't get much for price. No smell. Greasy. Wished I hadn't wasted the money. Thought this would be a pleasant splurge.